The honey bee industry is undervalued in Australia. Presently honey bee products are only priced at $125 million. What is often overlooked is that 52 of our food crops rely on honey bee pollination which adds an additional farm gate value of $6.5 billion. If Australia begins to suffer the honey bee decline seen elsewhere in the world, our agriculture industry will be paying for pollination services. The problem is that Australia would not have enough managed hives to meet demand, and the bees would need a healthy environment to hold over for the next flowering event. There are a number of barriers keeping beekeepers from becoming professional or running their own businesses. Low prices of honey bee products originating from Australia do not reflect their true value as unique and pure. Endemic flora, together with regulated isolation, has created the opportunity to produce rare honey bee products, and develop a niche market. Approved tests by which the quality of honey bee products is measured for international appreciation are unavailable to beekeepers and packers across Australia. These chemical tests need to be supported with clinical peer reviewed health claims so that exporters have confidence in their marketing. Tracking honey bee products from bush to shelf will be the basis of the high value chain. Native bush bee hive sites are critical for the health of bees, and we are losing them for various reasons. Climate change, especially the extremes we are now experiencing more frequently, bring fire and flood. Land use and policy changes block beekeepers from many of their sites. We have to find a way to protect and create new hive sites to keep our bees healthy. Beekeeper migration, chasing the next flowering event to keep their bee hives alive and healthy, and maintaining a honey bee product output is an art at present. Predicting a flowering event bees can feed from would not only save travelling time but ensure the best Australian flora is captured. 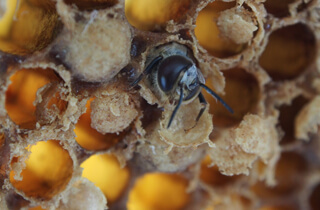 Quick and accurate recognition of bee diseases is needed with inexperienced beekeepers entering the industry and new diseases arriving in Australia. A rapid diagnosis and response to these diseases is needed to keep Australia as a haven for healthy bees for the rest of the world. Lack of an entry pathway to beekeeping to create a new generation of beekeepers has been identified as the limiting factor. This Cooperative Research Centre will provide opportunity, training and new start-ups.